Trueman Goba, industry leader, mentor of young engineers and champion of the transformation of the engineering profession in South Africa, received the degree Doctor of Engineering (DEng), honoris causa, from Stellenbosch University on 20 March 2018. 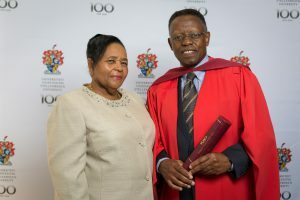 This honorary degree was awarded for his exceptional contribution to establish critical national infrastructure, his key role in growing and transforming South African civil engineering, his service as a thought leader taking national industry forward, and for ploughing back by showing aspiring young engineers the way to success. Trueman Thandabantu Goba has set himself apart as a leader in South African civil engineering, not only excelling as a first-rate engineer, but also unlocking the field for those less fortunate by serving as their mentor and role model. Holding the degree MEng (Civil Engineering) from Cornell University, United States, this born Durbanite is adept at various disciplines such as transportation, fluid mechanics, geotechnical and structural engineering. This has seen him contribute to award-winning projects, including the Nelson Mandela bridge (Johannesburg), the N4 Platinum toll freeway (North West), the Berg River dam (Franschhoek), the Durban harbour tunnel, the Tsitsa River bridge (Eastern Cape) and several 2010 FIFA World Cup stadiums. Moreover, Goba is widely respected as a champion for aspiring civil engineers from disadvantaged groups. Largely thanks to his mentorship, a significantly transformed South African civil engineering industry today has a promising pool of young black professionals, who in turn uplift their communities through vital infrastructure. In recognition of his industry leadership at a critical time for our democracy, Goba was elected the first black president of the South African Institution of Civil Engineering (SAICE) in 2002, and of the South African Academy of Engineering (SAAE) in 2016. Always ready to serve society, Goba provided seasoned leadership during ministerial appointments to the Construction Industry Development Board (CIDB) and the Engineering Council of South Africa (ECSA). As a presidential appointment to the country’s first National Planning Commission, he showed his mettle as a thought leader of note. Recent accolades recognising his commitment to engineering excellence and inclusivity include the SAICE gold medal – their highest honour – and a lifetime achievement award at the South African Professional Services Awards. Stellenbosch University salutes Trueman Goba as an engineer of not only key infrastructure, but of an entire new generation of high-impact professionals.